This is one of recipes I have tried because I’m a food blogger and I feel I have to do everything from a scratch 😉 But it also annoys me to find artificial ingredients in shop-bought candied orange zest. The recipe for candied zest comes from Usagi blog. 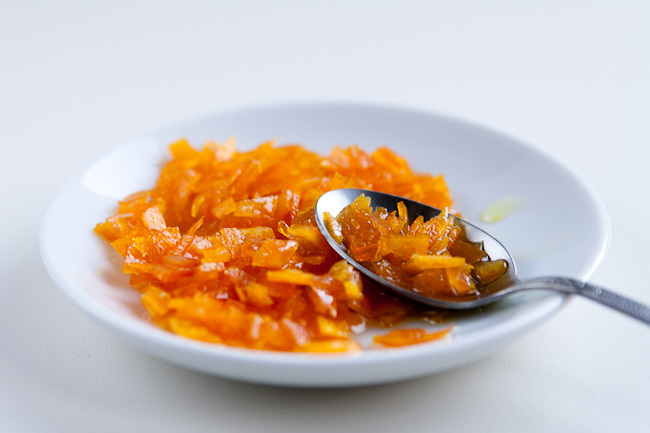 It isn’t traditional way of preparing candied orange zest, because you don’t boil it in a syrup. You just need to peel oranges, get rid off of the white pith, cover it with sugar and leave it for a few weeks to soften. Apparently the orange zest prepared this way is more fragrant and has nicer colour. And you can always add new layers of it at the top. Using a citrus zester, vegetable peeler or small knife peel the oranges. If there is any whit pith left on the zest, simply peel it with a knife. Cut zest into long stripes or small pieces (depending on how you want to use them). 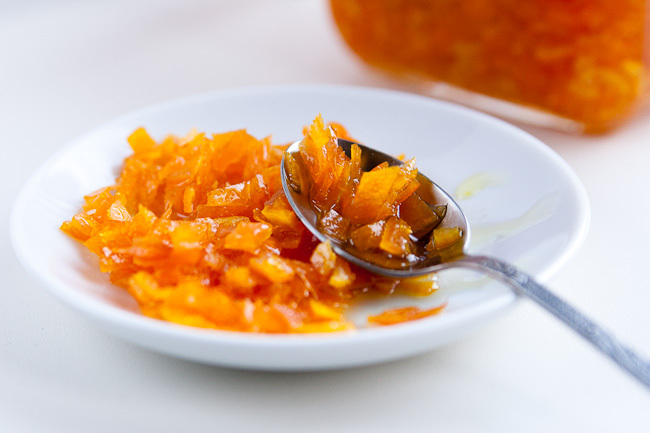 Put a layer of orange zest (not to thick) in the sterilised jar and cover it precisely with a layer of sugar. Press it well with a spoon. Keep going until you run out of the orange zest. Cover it with a thicker layer of sugar and leave it to rest for a few weeks. Posted in Christmas, Other sweets and tagged oranges. Bookmark the permalink. How industrious of you, Magda. You are a better woman than I. What lovely things will you make with it, I wonder. This is beautiful I’m always looking for more ways to infuse citrus flavor into my baking and this recipe uses such an interesting method.